June the 18th, 16 fished. Today’s Hall Green Home Guard AC contest was to be held at Tunnel Barn Farm, a popular fishery situated in the village of Shrewley, near Warwick. Today we were booked onto House, a pool which, according to the fishery website, is home to 140,000 fish. Now I’m sure I don’t need to tell you this, but that is a lot of fish. So many so in fact, that if you jumped in I’m absolutely almost certain you wouldn’t reach the bottom. Instead, you would sort of crowd-surf around the pool, like a rock-god floating on an audience of adoring carp. I think it’s safe for me to predict that of these 140,000 fish, every angler on today’s match would catch between .01 and .1 per cent of them; in other words, somewhere between 14 and 140. The venue had been under a considerable amount of angling pressure in the week leading up to this one: Monday, Tuesday and Wednesday saw the venue full, as the country’s finest commercial anglers contested the Daiwa Pole Masters; Thursday’s match was the ever-popular weekly veterans contest – usually a 50-60 pegger; on Friday the venue hosted the Garbolino Club Angler of the Year Midlands Qualifier, with virtually every peg in; Saturday saw the regular open contest and club matches. That’s a lot of fish caught and a lot of bait fed – these factors may have a detrimental effect on today’s match. I was also concerned that the weather may have an adverse effect on proceedings. The Met Office had predicted that temperatures could go above thirty degrees during the afternoon, and walking around the pool pre-match it was clear that many fish were already happily basking on the surface. … Apologies in advance for going off on a tangent here, but does anybody else think that ‘Tunnel Barn Farm’ sounds like the title of a Beatles track? Not one of the many extraordinary Lennon numbers, such as ‘Strawberry Fields Forever’ or ‘In My Life’, but one of those twee, throwaway songs McCartney composed whilst having a poo. ‘Ob-La-Di Ob-La-Da’, ‘Rocky Raccoon’ and ‘Martha My Dear’ all spring to mind. Anyway, back to today’s events, and most importantly, the draw. I didn’t fancy either peg 10 or 27, and luckily two late no-shows meant we could leave them out of the hat altogether. As I tentatively put my hand into the bag of doom, I pulled out… 19. Happy enough with that, from memory this area holds a large head of small fish, with the chance of a bigger specimen long down to the left, by the bridge. Also, the peg was in a bit of shade, which was handy on two fronts: firstly it might give the fish somewhere cool to settle and secondly, it would give me a little shelter from the stifling sun. Peg 19, a fair draw. It soon became apparent that some strong anglers had drawn noted pegs, so I felt I might be up against it. Mark Seaborn was on 4 and Tony Newbold 6. Over the bridge (always a good area) we had tidy anglers on good pegs: Steve Wheeler, Kev Dickinson and Joe Wood on 29, 32 and 33 respectively. I decided to keep things simple bait-wise for today’s match. I’ve noticed previously that after a period of excessive angling pressure, and particularly after a festival where gallons of casters are fed, the fish at Tunnel Barn switch back on to pellets. So, aside from one line which I would feed by hand with casters, I decided on fishing hard 4mm pellets everywhere. Plumbing-up I found that I had virtually the same depth all over the peg – three to three and a half feet. I fancied the long reed-bed opposite to be a good line, probably for some shallow fish. Some lilies to my right were also bound to hold a few f1s. My caster line would be fed at 2 + 2 down to my left, I planned to leave this until the mid-way stage of the contest, when I hoped a few fish would settle over my bait and feed with confidence. Right, you can wake up now. At 10.30 the all-in was called, I catapulted a few pellets over to the rushes, threw a pinch of casters down to my left, and laid my deck rig in at top kit plus one, down to my right. This is how I hoped to spend the first hour, priming other lines while I caught a few on the short pole. To some extent things went to plan, I managed a dozen small f1s in this period, all on a lassoed 4mm pellet. All the while I kept the caster and far-bank lines topped up, hoping to plunder them when the fish had gained confidence. Fish were knocking at the reeds and slurping when I catapulted pellets, so on the hour mark I left my short pole line, with the intention of keeping it topped-up regularly, and went over with the deeper tapping rig. For those of you that have never ‘tapped’, this is primarily a method that catches f1s – proper carp seem less willing to feed directly below the pole tip, so a longer line and slapping/laying the rig in works best. The idea behind tapping is to feed little or nothing while the rig is in and to antagonise a fish onto the hook; keep a direct line from pole tip to hook (over-shot the float) and tap the surface with the pole tip, mimicking the sound of pellets hitting the water. I always feed when playing fish, or before I ship out, but when the rig is in place it’s rare for me to feed. It’s a tactic that is often pilloried, written off as a ‘noddy’ method – but as with all techniques, it has its little nuances that set those that are good at it apart from those that aren’t. ‘Tapping’ can be a deadly method – and two fish in two put-ins made me believe that this would be the case today. When I went in for a third time I fully expected to catch within seconds, but there was no response. I moved along the reed-bed a foot left and right, but couldn’t buy a bite. I tried both the shallower tapping rig and the conventional shallow rig, but fish remained hard to come by. I also tried a shallow caster rig to the reeds, but this brought just one fish. I approached the two hour mark with twenty f1s in the net, which was slow going but kept me ahead of those in my eyeline. As I’d made a conscious decision to leave the caster line until the midway point of the match, I spent the next half an hour fishing the deck rig either to the lilies, or at 13m to the far bank. I had plenty of indications across but struggled with liners, perhaps catapulting wasn’t the correct way of feeding this line, or I was merely fishing in the wrong depth. Whichever way I made the decision to stop catapulting to the far bank, as this was causing carnage in my peg. As the half way point of the contest approached, I was itching to give the caster line a try. I had fed it methodically since the beginning of the match, and although feeding by hand isn’t a strong point of mine, I’d managed to get the feed to group nicely by the near bank. I slipped a caster onto my b911 f1 hook, threw in a dozen casters and laid the rig in. Straight away I was into small perch and roach, often on the drop – not really what I was after. I tried grouping my shot closer to the hooklength with just one dropper, but it didn’t feel right. In hindsight, a 4 x 10 float was far too negative to fish in three and a half feet of water. I should have used a 4 x 12 or even a 4 x 14, to get the rig through the hoardes of nuiscance fish in the swim. My twenty minute stint on the caster line yielded just one f1 and 1b of silver fish, so I scrapped this off for the remainder of the contest. With a little over two hours to go, I made the best decision of my match: I went back out to the reeds, this time feeding a dozen 4mm pellets every put-in through a cad pot. This worked a treat and by lifting and dropping, being patient and not reaching for the catapult, I managed another 20 fish over the next hour, all of which were hooked cleanly. While fishing this swim, I constantly dripped 4mms down to my right. Concentrating on just the two lines seemed to be the correct tactic as I approached the last hour, as fish were now swirling amongst the near-side lilies when I fed. With an hour to go, I moved back over my right hand edge line, this time fishing shallow. 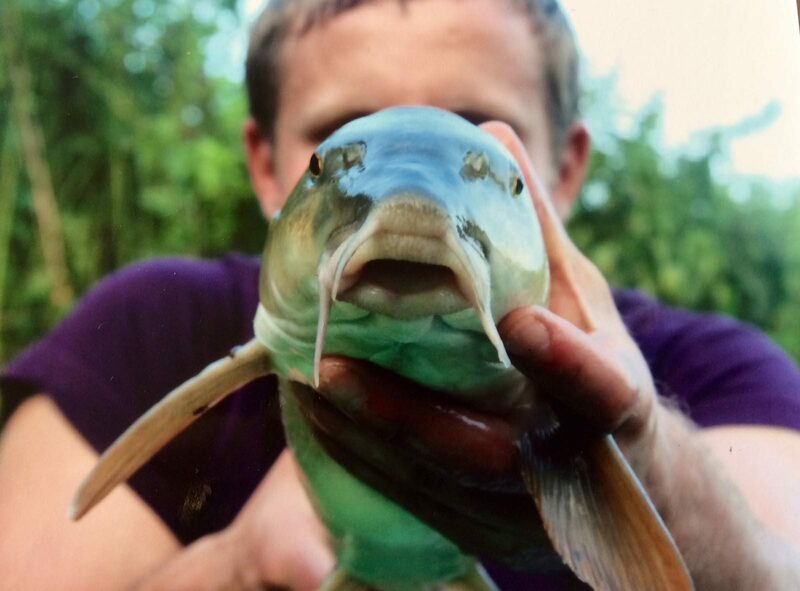 I managed at least 20 fish in this period, tapping around the lilies, feeding small amounts of 4mm pellets regularly. The latter part of the contest was really enjoyable and I was sad to hear the whistle blow for the all-out. Best line of the day, the right hand edge. I estimated I’d managed 40 fish in the final two hours of the match, to go with around 35 in the preceding three hours. As mentioned earlier, the fish are a very small stamp in this area, so 75 fish would probably go around 75lb. Not bagging by any means, but a lovely, busy day’s fishing. I quickly packed my gear away and made my way around to assist with the weighing-in. On peg 1 Ian Gibson placed 32lb on the scales, followed by chairman Bob with 52lb. On Peg 4, Mark Seaborn managed 32lb, then Tony Newbold upped the ante with 55lb. Next to weigh was Brian Fowler who was owning up to 50lb; I’ve fished with Brian for a few years now, and know that his 50lb is more like 65/70lb. As it stood, Brian’s underestimation was even greater than expected, as he placed 76lb on the scales! A quick word on Brian, he’s the loveliest bloke you could wish to meet. So lovely in fact, that if anything terrible ever happened to Santa and there was an election for Endearing Portly Christmas Representative, Brian would win it hands-down. Not only this, the man can fish – he turns up with his battered old Shakespeare seatbox, bent bait-waiter and warped rod-rest, and he bags up. If anybody were to beat me today, I could quite easily cope if it was Brian. Next up we weighed-in pegs 12 round to 16, top weight from this area was Moggy’s feeder-caught 41lb. Then it was over the bridge where it was rumoured Joe had snared a few; there was a 38lb an 8lb and a 49lb, before Joe plonked 55lb of maggot-caught f1s onto the scales. Next it was my turn, it would clearly be close between me and Brian. My first net went 40lb, as I lifted my next one I was sure it felt a little lighter, and so it proved, it went 37lb, giving me the match win by a mere 15 ounces. Today’s Man of the Match award goes to Richard Caswell. He was tired and downbeat after a tough day’s fishing on the Saturday – then he turned up, drew an average peg, and managed 3rd with 58lb of jigga-caught f1s. Top angling mate. Schadenfreude is a German word, the literal translation of which is ‘harm-joy’, it is used to describe ‘pleasure derived from the misfortune of others’. Today’s funniest moment comes with no small measure of harm-joy, I wasn’t present at the incident but I’m told it’s a shoo-in for this week’s award. Apparently, a member of the fishery staff was driving a golf buggy around the site at ridiculous speeds, he overcooked a bend and came flying out of the vehicle. Fortunately he was left, for the most part, unscathed. All that was damaged was his pride – and his spine. I’m told that this impromtu audition for Jackass was absolutely hilarious, so it wins this week’s award. I was a little apprehensive before today’s match, it falling on Father’s Day, and my first one without my dear Dad. I needn’t have worried – he taught me not to take life too seriously, to live and love, to enjoy the sunshine and a few drinks. I did all of this today – Happy Father’s Day, old fella. Well written Dan but what’s this chapter about helping with the weighing in? Well done Sunday – speak soon.